The ABC song is an old classic, but there’s always room for more than one technique to teach the alphabet. Some of the rhymes were quite clever. The most memorable one for me involved the letter “R” as well as my favorite animal. It made me smile. Giving the letters faces was a smart idea, and I enjoyed discovering what each one of them was up to according to their stanzas. This is a cute concept. It’s something I’ll keep in mind for my youngest nieces and nephews. Once again the introduction that was intended for children was too long for the age group for which it intended. It was written in the form of a rhyme. While I enjoyed reading it, most of the preschoolers I’ve known would have some trouble paying attention like this due to its length and the lack of pictures. This section would have worked better for an older audience even though the subject matter is a good choice for the 3+ age group. The illustrations in this storybook were wonderfully detailed. The colors in them were vibrant and complementary. There is something special waiting for readers on each page. Telling you exactly what it is would ruin the surprise, but I grinned when I finally noticed it. It was well done. At first I couldn’t believe that I’d ever overlooked it. 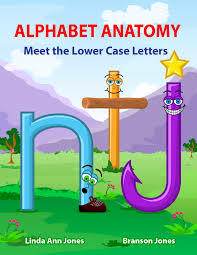 I’d recommend Alphabet Anatomy: Meet the Lower Case Letters to anyone who is teaching the alphabet to a young child.